This will be another short report since we have sailed just 10 days since our last report. 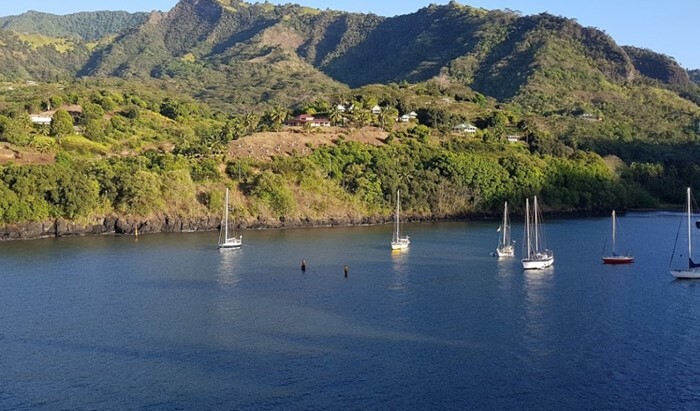 We were not able to rejoin Glide in Hiva Oa in January as planned but hope to return in late March. Our delayed return gave us the opportunity to fly to Guna Yala (San Blas islands), Panama to join friends Neil & Helen McCubbin on Milvina who are cruising with the Suzie Too Rally from Curacao to the Western Caribbean. The morning of our arrival in Guna Yala, we sailed to Mamitupu and anchored next to Maggie Salter and Al Hickey on Sweet Dreams, our neighbors in Pulpit Harbor, Maine! We also shared anchorages with Rick & Julie Peterson on Believe, John & Sally Anne Potter on Capall Mara, Ronna & Michael Benjamin on Exodus, Adrian & Clare Richards on Flyin Low of Poole, Steve Tull & DeAnne Trigg on La Mischief, Jenny Thomas & Ken Robertson on Lady Rebel, Lizzy & Steve Cronje on Not All There, Ryan & Renee Klapper on Poerava, Jeff & Marcia Larason on Ujamm’n, Andy & Alison Nelson on Venture Lady, Mark & Lisa Pollington on Wild Iris and Steve Dywre & Cindy Cady on Willow. We shared our final anchorage at Isla Gerti with Margie & Marcus Hayward on Island Kea, where we shared a wonderful Guna meal with our friend Bredio and his family; the next day we went with him on a river trip to find the crocodiles who live there. It was a wonderful end to our short visit to Guna Yala where we had cruised on Glide from 2007–2010. We were delighted to connect via the OCC SSB Net with friends from former OCC cruises: Rob & Frances Lythgoe on Alia Vita (in Maine), John & Angela Edmundson on Galadriel (in Newfoundland and Maine), Carol & Steve Kerswill on Innomarata II (Bahamas to Ile-a-Vache, Haiti) and Ian & Ann Clarke on Tourterelle (Beaufort, NC to Bahamas). We were sorry not to connect with others with whom we have cruised: Corrie & Jan Steenmeijer on Livingstone (in Maine), David & Leanne Vogel on Perigee (in Maine) and Fiona & Steve Bailey on Super Tramp (in Maine). It’s was great to have so many OCC friends cruising in the same vicinity! When we return to Glide in late March, we will spend time cruising the Marquesas. Then we’ll be off to the Tuamotu atolls, then Tahiti and the other Society Islands. We’ll be heading to Cook Islands, Tonga, Fiji and other islands along the way and then on to Australia and New Zealand. We look forward to many more OCC encounters along the way!